April showers bring May flowers, right? We are stoked for all the new content that Netflix will stream this month. Netflix Originals are leading the race with highly anticipated content. Brad Pitt is taking over the headlines with War Machine, House of Cards is returning for Season 5, Sense8 is feeding us a second season of the highly buzzed show and you don’t want to miss the final season of Bloodline. Whether it’s warming up outside or not, Netflix is surely heating up. 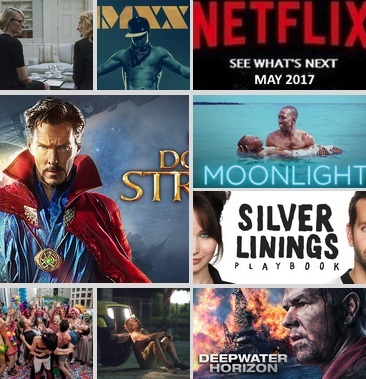 Apart from the originals, buzz-worthy movies such as Moonlight, The Fault in Our Stars, Deepwater Horizon and Silver Linings Playbook are just some of the content we can’t wait to binge watch. Brad Pitt stars in the Netflix Original movie War Machine, based on the true story of a U.S. general who takes hold of NATO forces in war-torn Afghanistan, but is soon threatened by a journalist’s exposé on his power and regime. Lana Wachowski and Lilly Wachowski are returning with a second season of their highly anticipated series Sense8. Watch as they take this season to the next level. After the unbelievable season 2 finale of Bloodline, we are really looking forward to the final season, which will also air this month. With Ben Mendelsohn winning an Emmy for his role as the oldest son, Danny Rayburn, and Kyle Chandler receiving an Emmy nomination as John Rayburn, this dark family story takes the trophy in our eyes. Oscar-winning film Moonlight is finally available for streaming on Netflix. Mahershala Ali, who took home an Oscar for Best Supporting Actor, gives an outstanding performance alongside Trevante Rhodes, André Holland, Janelle Monáe and Naomie Harris. You can enjoy the tear-jerking film and don’t forget to check out our interviews with the cast. If you want to curl up and binge on a film that pulls at your heartstrings, John Green’s The Fault in Our Stars is just the fix for you. Mark Wahlberg stars in Deepwater Horizon, based on the infamous oil rig explosion, while Dwayne Johnson brings all the muscle and good looks as he heats up the screen in San Andreas. Eye candy Channing Tatum shows off his moves in Magic Mike XXL, while Jennifer Lawrence and Bradley Cooper fill the screen with charm, wit and steamy romance in the comedy Silver Linings Playbook. So, is your boss giving you trouble? On those particularly gloomy days, sit down and unwind with Office Space. And definitely don’t get any ideas from this one. Benedict Cumberbatch goes on a quest for a miracle cure and finds a mystical and mysterious sorcerer called the Ancient One in the Marvel film Doctor Strange. If that isn’t up your alley, you can serve yourself a sci-fi flick filled with adventure and comedy: Chappie to the rescue. The Girl with All the Gifts is a dystopian film that might also appeal to fantasy fans. Bloodline Season 3 is already ready to be watched? I’m in! the girl with all the gifts. phenomenal reviews everywhere. must see for a different take on the zombie rage right now.